At S&P we have a wide range of roof, centrifugal and helicoidally fans for residential, commercial and industrial applications. Our roof fans range offer models designed for ventilation of homes and small enclosures like the Ecowatt CTB to roof fans of industrial application like the series TMPB / TMPT, designed to move around corrosive gases. 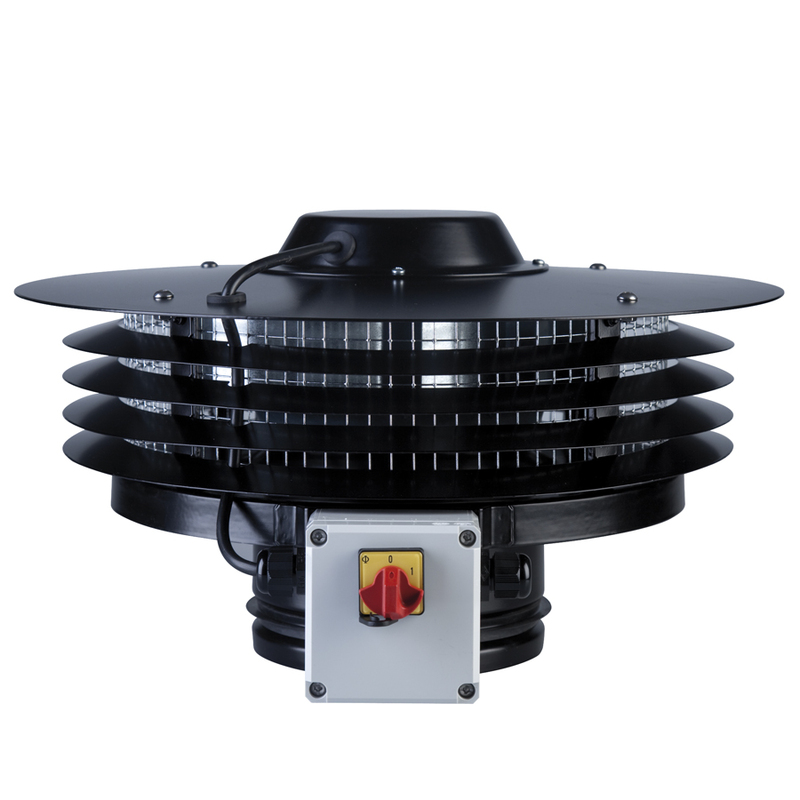 Also in our range of roof fans you will find ATEX versions, designed for the extraction of air in explosive atmospheres. The series CRHB Ecowatt Plus off centrifugal roof mounted fans allow big energetic saves thanks to their low consumption. This units are fitted with: EC external rotor motor, centrifugal backward curved impeller, steel finger guard, base manufactured from galvanized sheet steel. Its integral control enables the fan operating in 4 different modes: constant pressure mode, constant volume mode, proportional mode and min-max mode. The hybrid type, self-regulating centrifugal roof fans, CTBH ECOWATT, have low profile to fit directly to a circular duct for ventilating homes and small work spaces. This range of fans start up automatically when temperature conditions do not permit sufficient natural air circulation. This self-regulating centrifugal roof fans galvanised sheet steel protected by black polyester paint, an aluminium cover. Moreover it is equipped with an external EC motor, thermal protection and IP55 on-off switch, which can be moved away from the fan. 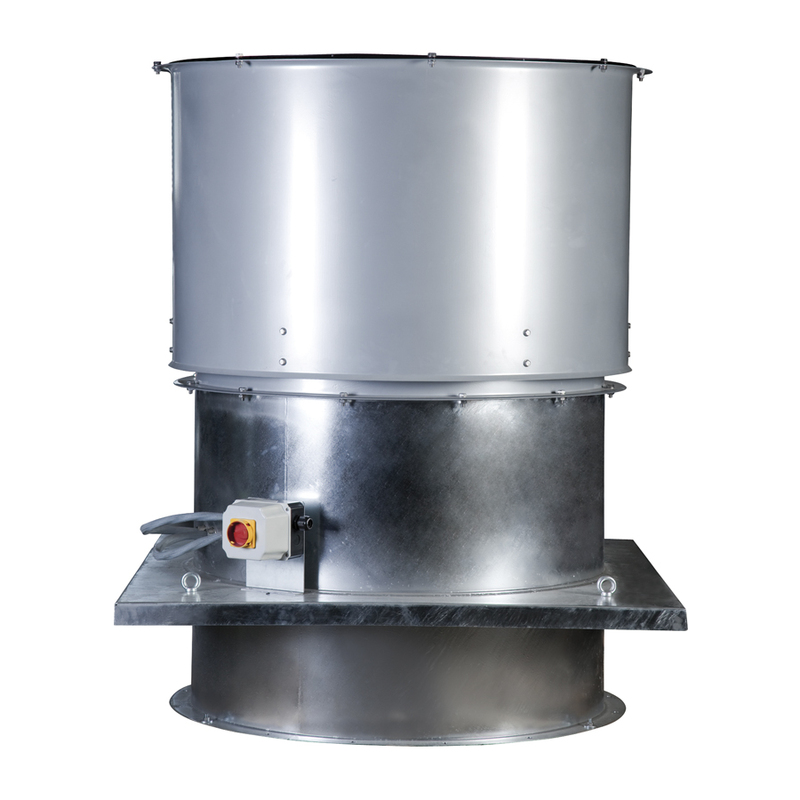 The range of centrifugal roof mounted fans in horizontal discharge format, Max-Temp CTHB/CTHT are designed for smoke extraction in fire conditions and certified F400-120 (CE marked). All models are suitable for air stream temperature up to 120ºC. Bases are manufactures from galvanised sheet steel and cowls are manufactures from spun aluminium. All models incorporate bird-proof guard, and they are available, depending on the model with single or three phase motors in 4, 6, 8, 4/8 or 6/12 poles. HGTT-V series of mounted axial flow fans, with vertical air discharge configuration. Is made from a casing formed from rolled sheet steel welded on the base with a corrosion resistant hot dipped galvanized finished. This fan has a high grade die-cast aluminium blades locked within a pressed sheet steel hub. Moreover it has a backdraft shutter and a bird proof outlet. Cylindrical casing formed from rolled sheet steel protected against corrosion by grey polyester paint coating. The motor of this range is a three-phase four pole motor, IP55, class F insulation, on request this motors can be also of 6 pole and 2 speed motors 4/6 and 4/8 poles.